To customize this template after signing up, choose ‘Business Quiz’ as example when creating a new survey. The importance of business quizzes comes down to the importance of knowledge on how to do business itself. The point of a business quiz is a fun and educative way to test your knowledge and teach you more about business which in turn makes you a better businessman/woman or entrepreneur. At the heart of your business success lies a successful strategy. That strategy includes but is not limited to marketing, logistics, finance, sales and much more. All of these facets will play a role in your success in business! Why use Survey Anyplace as a Business Quiz Tool? Include a leaderboard and create a competition of who scores the best. Or just show off your results to your colleagues. Got an answer wrong? Receive feedback immediately! Our quizzes can be taken online, or offline with any device and made available in any language. That means higher response rates and better data. 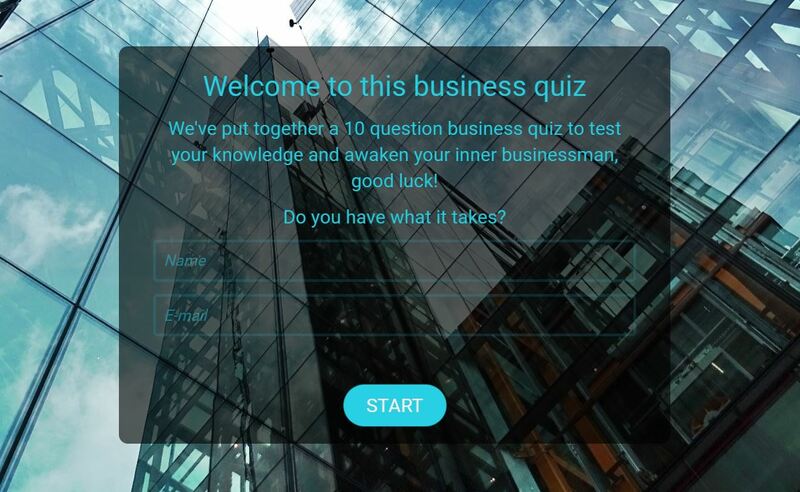 To use this sample Business Quiz, sign up for Survey Anyplace , and choose ‘Business Quiz’ as template when creating a new survey. Keep it short and fun! For any type of quiz, it is a great advantage to be digital and filled out through tablet or smartphone. This allows the quiz to be shared through Email, Social Media or other online platforms. Our tool happens to do just that, with our mobile-optimized software, we are set on giving your respondents the best experience we can.